Today I wanted to share with you this easy, fresh, and simple outfit that is quite inexpensive yet trendy and stylish. I know many of us think that to be stylish or trendy we have to wear expensive clothing. That is so not true, actually it is very far from being true. I admire a woman who can put pieces together, look like a million dollars but only costing a hundred dollars or even fifty dollars. (honestly, I love doing that)I have three tips for you that will help you to remain stylish on a budget. Shop sales: Sales should be your best friend and patience and organization is key when it comes to shopping sales. I love shopping on sales that is when you get the brand name and most high price items for next to nothing. Lots of this can be done online. 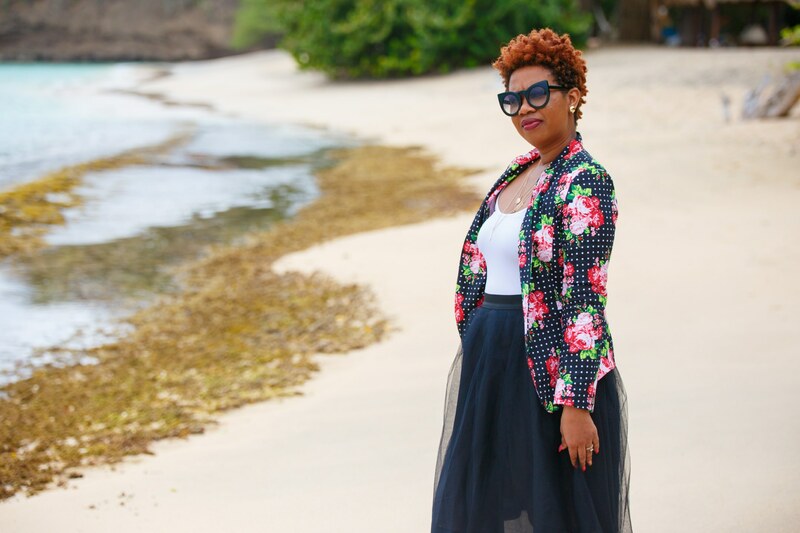 Shop regularly at trendy/affordable stores: Here in Grenada, we have lots of local boutiques, but I have a few favorites that I really love to shop in. This Floral Blazer is from Adeebe’s Boutique and believe me they are an affordable store that bring you awesome clothing for cheap. Shop off season: This might seem redundant but if saving money means buying clothing and putting them away until the you are ready for it then do so. I always do so and it works. I hope you get inspired by this look.